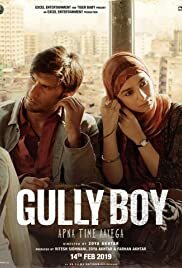 Gully Boy is a 2019 Indian Hindi-language musical drama film written by Zoya Akhtar and Reema Kagti, and directed by Akhtar. The film is co-produced by Ritesh Sidhwani, Akhtar and Farhan Akhtar under the banners of Tiger Baby and Excel Entertainmentproductions. Inspired by the lives of street rappers Divine and Naezy, it stars Ranveer Singh and Alia Bhatt, and features Kalki Koechlin, Siddhant Chaturvedi, and Vijay Raaz in supporting roles. Principal photography for Gully Boy began in January 2018 and wrapped up in April 2018. It premiered at the Berlin International Film Festival on 9 February 2019, and was released theatrically on 14 February 2019 to positive reviews from critics. It earned over ₹171 crore (US$24 million) worldwide against a production budget of ₹40 crore (US$5.6 million).